CRYOTEC Company was created by two science specialists of the General Physic Institute of the Russian Academy of Science in May 1996, its main office is located in the building of the Institute. Long-term experience of scientific researches of company` employees in the field of physics of low temperatures and cryogenic technics became a basis of the company activity in development, manufacture and realization of the cryogenic and microcryogenic technical equipment and technologies for medicine, industry, science and agriculture. We recognize that reputation of the company at the market is the key capital and it is created for a long time. We create our reputation peacefully and thoroughly. However we work operatively, solving tasks and the problems put with our customers and by the market in whole. Now 30 highly skilled specialists work in Cryotec company staff on a regular basis and if necessary we involve experts for participation in various projects on a time basis. The key positions in the company occupy physic scientists and engineers in the field of cryogenic technology, which have large experience in engineering and design. Development and production of small series of the high technology and high effective cryogenic technical equipment in short terms is the base of Cryotec activity. We are proud that we are one of two companies in Europe, owning technology and know-how for manufacture of the automatic systems for dose injection of liquid nitrogen (AZOTInject) in the containers from polyethylene and aluminium and also other containers in the production lines of pouring and packing of food and household chemical products for creation of overpressure and inert environment. Cryotec is the unique company in Russia, which produces serially the portable medical cryosurgical devices working with liquid nitrogen. For their production we use high-quality non-polluting materials (stainless steel, copper, nickel, polytetrafluoroethylene, silicone, etc.). "CryoInej" Cryo Apparatus has received the bronze medal and the diploma of the Geneva Invention Show in 1998. Development of the cryogenic smoke generator for concert platforms, discos, theatrical performances and shows, which do not have analogues in the world, is finished and the pre-production model will be manufactured and tested in 2010. All our developments and inventions are protected by patents of the Russian Federation and PCT. In April, 2010, Cryotec Company has received the license of RosCosmos for the right of development, manufacture and delivery of cryogenic technical equipment and technologies for the International Cosmos Station. Now the company passes the ISO-9000 certification procedure. Cryotec Company is the exclusive distributor of the German company - Linde Gas Therapeutics GmbH - assignee of Crio Medizintechnik GmbH and subsidiary of the largest company in the field of cryogenic and gas technology - Linde Group Russian, in Russian, CIS countries and Baltia. 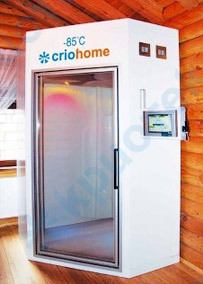 Linde Gas Therapeutics GmbH produces the unique medical systems CryoSpace, Criohome и CryoJet для common and local air cryotherapy. We also are the distributor of such well known European companies as VRV (Italy), Cryo Diffusion (France), Consarctic (Germany), Innovag AG (Germany), Airsonett (Sweden), H&O Equipments (Belgium), Askion (Germany), manufacturing the cryogenic containers and gas generators, equipment for cryobanks - cryostorages, program freezers, Dewar vessels, etc. Cryotec Company provides all clients with guarantee and post-warranty service, full set of documentation in Russian, assists in training to techniques. We support constant business contacts to medical institutions in all over the Russia, including Presidential Property Management Department of the Russian Federation, Bank of Russia, Military and Medical Department of Federal Security Service of Russia, etc., and also with the leading centers and experts in the field of physiotherapy, rehabilitation, pulmonology, sport medicine, cryoconservation. Our clients are more than 1000 large and small companies, plants and enterprises in Moscow, Saint Petersburg and other regions of Russia and CIS countries. During existence of the company we realized more than 5 thousand orders for equipment. Cryotec Company invites to cooperation the organizations and private persons interested in our production and services.